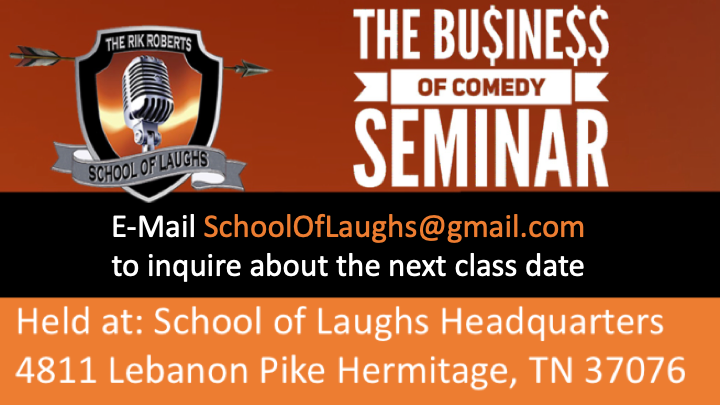 Pre-register now E-mail Rik at SchoolOfLaughs@gmail.com with “Save My Comedy Business Class Spot” in the heading and your name and cell phone in the body of the message. I’ll reply back and let you know if a spot is available. You will learn more in this session about the business side of being funny than some comics learn in their entire career. You can take this class without any experience. It is a real eye opener into the world of comedy as a career. What goes in my promo kit? When should I approach the clubs? How do I get in with bookers? How do I promote myself? Do I need a web site? How much do comedians make? What market best suits my act? What is a realistic timeline for my career? What merchandise sells? Where do I get it? What should I do for free, and where do I draw the line?